At Advanced Handling and Storage, not only do we offer pallet racking? we also offer shelving! We supply, deliver and install shelving for companies from offices, to schools, from museums to warehouses? you name it! We can offer both secondhand and new solutions to suit your business needs. We always bang on about how important it is to make sure your warehouse is working as efficiently as possible, but you also need order in your office etc to make every process as streamlined as possible! Shelving can be used for a whole host of purposes including archiving, storing customer files, organising small products, organising internal post etc? it really is a versatile solution with so many benefits! How many times have you gone to look for a file for it not to be where you left it? Exactly? far too many to count! A shelving solution really can help you be more organised. 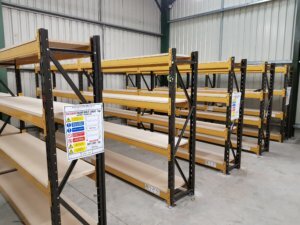 If you are looking for either a new or secondhand shelving solution, please don?t hesitate to get in touch with us on 0800 345 7088 or please send an email to sales@advanced-handling.co.uk ? we can advise you of the secondhand shelving that we have in stock or advise on a cost on new? whichever you like! Make sure you follow?#TeamAdvanced?on Social media for all our latest news and offers. Site designed & developed by Geonet Solutions.